I'd love to be able to grow bananas in my yard. Yes! Housing needs to produce things that are useful. Yes, I'd love a little farm plot. I believe this does open whole new aspect of food system in the game. Lots of things can "happen" while processing it, so much to do etc. I thought they mentioned this in the past to be on the list for future content. Would be great that housing would bring something extra. Incorporating farming simulator into a running simulator. I like the way you think. Dragonborn, huh? Was it your ma or your pa that was the dragon? yup... and a plot for alchemy stuff too. Yes please! I'd love a little fruit and veg patch. Plant seeds, go off on thrilling adventures, return and grab veggie goodies the next day. When I wanna pick some ripe bananas I go Alessia bridge. If we get to grow things inside our homes, Id settle for columbine. The last thing the alliances need is citizens pulling a Tom Selleck and stealing water during droughts because they wanna grow avocados in their houses. Yes! I really wish the homes were more useful. Until storage chests, it was mostly a way for new toons to easily access some zones. It would make going to my home enjoyable, to harvest my goodies. It would encourage getting more homes to get more farm plots, etc. The different plots should be Furnishing Plans, and also crown store. I want to grow provisioning and alchemy ingredients. Also, we need fruit tree plots for Majicka receipes, and an animal pen for Health recipes. I want a beehive for honey. For homes with water, you should be able to have a furnishing plan for a fishing spot. This would be amazing, grow like maybe my 6 most used Alchemcal reagents. Also maybe kill off the stupid farmers too? Who knows. I'd love it but I can already hear the yowling about how it's unfair that house owners get extra mats. PvE incentive to do all those quest, get the achievements so you can buy the houses. Only question would be the Crown Store only ones. That's perfectly rational, yes. This, however, will not be an obstacle for some to object vigorously. I love the idea, especially for some of the properties that have so much spare land. 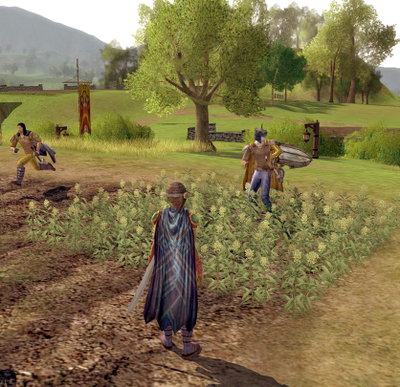 I loved being a cook in LoTRO. Had to grow all my ingredients. Was a real chore and a bit of a grind but good, wholesome crafting fun! FARMVILLE is not a game I am interested in. Gardening dailies were one of the reasons I left World of Warcraft and other MMO's like it. Let me simply purchase the "row" for the type of plants I wish to harvest every 24 hours and then let me drop it on a spot outside my house. NO MAINTENANCE OR QUEST. Better yet... don't allow me to pick it just have those plants auto drop into my crafting bag every 24 hours. Even better, more immersive yet another way zos can earn money: Sell us NPCs that would maintain the plants for us. Provisioning NPC could tend the plants needed for cooking, every week we get the harvest of one type of plant we told him to grow. Alchemy NPC could grow some herbs needed for potions, or fungus needed for poisons, depending what we choose for him to produce. Zos could make these NPCs about 2k each and I am sure ppl would buy them. I'd like some wee folk to tend the garden, like hobbits only not. Most agree, also possibly breeding. Then remove the food crates in delves and let the food economy become players driven. I see they re gonna give rewards for daily login, but such mini games would be a more elegant way to do it. This would be a great feature for alchemist. Being able to grow there most commonly used reagents. I would want this to be looked at very carefully before implementing - even though as a housing nut this would benifit me enormously. In wow when they did similar it crashed part of the economy.